Working with several high net worth individuals across the country, we at KJ Harrison Investors have come to understand and appreciate the many complexities associated with wealth, and the important role that having a solid strategy plays in the management of these complex issues. That’s why I wanted to write about a topic that is close to my heart—STRATEGY. In fact, I was thinking about this one day as I went for a run, and it came to me in an Archimedes-style “eureka moment.” I realized two of my passions—history and strategy—can be found in the tales of the Trojan War. Whether myth or historical fact, for me, the Trojan War is a great story of strategy. After nine years of fighting, the Greek army had been unable to penetrate the walled city of Troy. The army appeared to abandon the effort and sailed away, leaving behind that now infamous gift of a wooden horse. The Trojans celebrated what they thought was victory and brought the wooden horse into the city. As we all know, things went hideously wrong for the Trojans after dark, when the soldiers hidden inside the horse emerged to open the city gates. The Greek army had a strategy that was both planned and executed perfectly, and I see this as having applications to the complexities of wealth management today. 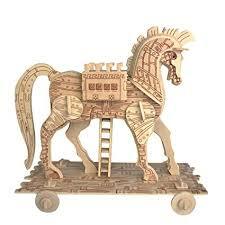 What does this have to do with the story of the Trojan horse? The Greeks fought for nine years without achieving their goal. They kept doing the same thing, even though it wasn’t working. In modern business terms, there was no “growth” in the Greek position. It was only when the military leaders decided to do something different that they achieved their aspiration. They changed their strategy. They didn’t try to knock down the gate with brute force, but simply unlocked the doors from the inside. Brilliant! And the execution was just as brilliant—sailing out of sight and later returning to the now unlocked gates and victory. The takeaway from this is simple. Strategy is about change and planning. If you’re really serious about managing your wealth and achieving your definition of financial success, you might need to accept change. Change is hard, and that’s why planning and strategy can be hard. As the Greeks did, you too may want to consider a critical examination of your current wealth strategies in order to achieve a different result.